Like people who are born colorblind, fatherlessness changes the very essence of the way one sees the world. It may be something that is not readily obvious, but attitudes, perspectives, and missing pieces become evident throughout a child’s maturation and well into adulthood. 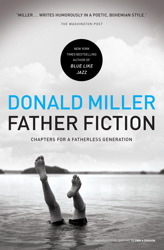 In his new book, Father Fiction: Chapters for a Fatherless Generation, Donald Miller paints a picture of his own life without a father. Challenged with his own deviance, he speaks with the perspective of a man who has hope that lives can be changed and healing can come. Miller talks about the destructive path he was on and how the influence of a strong, compassionate man made all the difference for him. While a book on being a boy without a father, many of these same things can be said about those who have lived with a neglectful or emotionally unavailable father. We need to be directed to our Heavenly Father. The hope that Miller gives is a challenge: to seek out the fatherless, to mentor them, and to help them to live a better life. He believes that we can reduce the number of prisons simply by seeking out young men who lack that basic influence and raise them up to be more responsible adults. In the biblical economy, the fatherless were to be given the same respect and compassion as widows. No doubt Miller’s hope is reflected in Scripture, and this book can help to challenge and inspire people to take the next steps to find healing in their own lives, but to also work to influence others toward a life committed to our heavenly Father.